The Dutch Shoe Mystery - Description | W. W. Norton & Company Ltd.
After a wealthy woman is strangled in a hospital full of relatives and friends, Ellery Queen searches for her deadly enemy. When Ellery Queen, described by the London Times as “the logical successor to Sherlock Holmes,” is invited by his friend, a doctor, to witness an operation, he accepts the offer in hopes of furthering his capabilities as an amateur detective, but soon ends up testing those same skills. The patient who is about to undergo the delicate procedure is Abagail Doorn, the richest and most famous woman in America; the doctor who will perform it is her protégé, one of the leading surgeons on the East Coast. It will all take place in the main operating theater of the vast hospital that she founded. Relatives and friends, and even some enemies, wait with bated breath to learn the outcome of the operation. The institution is hushed, the audience seated, the theater ready. The surgeon calls for his distinguished patient, and the doors swing open. A still form covered in a white sheet is wheeled into the theater. But when the sheet is removed, it reveals Ms. Doorn’s corpse, strangled to death with a picture wire. Who among the attendees was ruthless enough to carry out this gruesome operation? 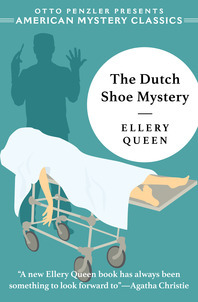 It’s up to Ellery Queen—and his most perceptive readers—to uncover the clues and find out. A topsy-turvy crime scene sends a detective on a puzzling quest for the truth. A detective steeped in the art of magic solves the mystifying murder of two occultists.